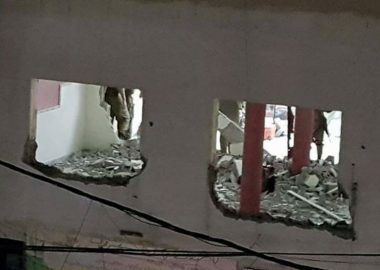 Israeli soldiers demolished, late on Wednesday at night, the home of a Palestinian detainee, who is imprisoned on charges of crashing into a military roadblock on March 17, 2018, killing two soldiers. The Israeli army has claimed that Ala’ Rateb Kabaha, 26, deliberately rammed soldiers at the military roadblocks, killing Lieutenant Ziv Daus, 21, from Azur town near Tel Aviv, and Sergeant Netanel Kahalani, 20, from Elyakim Moshav, in the Megiddo Regional Council, in the northern part of the country. 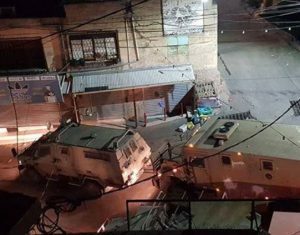 Media sources in Jenin said that on Wednesday night, at least twenty military vehicles and jeeps invaded Barta’a town, southwest of the northern West Bank city of Jenin, before invading the Kabaha family home. They added that the Kabaha family lives on the third floor of a four-story building, owned by Ala’s father. The soldiers demolished the interior of the 150 square/meter apartment. The destruction of the interior walls caused structural damage, which may result in the entire building needing to be torn down. It is Israeli policy to engage in ‘punitive demolitions’ of the homes of Palestinians who are charged with crimes against the Israeli military occupiers. The army claims that the demolitions of the family homes act as a ‘deterrent’ against future attacks, but there is no evidence to support this claim. In addition, the demolition of the homes of family members of those accused of crimes is considered a violation of international law, as it is a form of collective punishment. It is worth mentioning that the family only received the official demolition order two weeks ago.